Find yourself at water level among the many species of whales, sea otters, sea lions, and birds that inhabit the area; or take advantage of the mobility afforded by kayak and embark on excursions to shore. For anyone who doesn’t feel up to the kayaking experience, don’t worry, you don’t have to miss out on a thing. 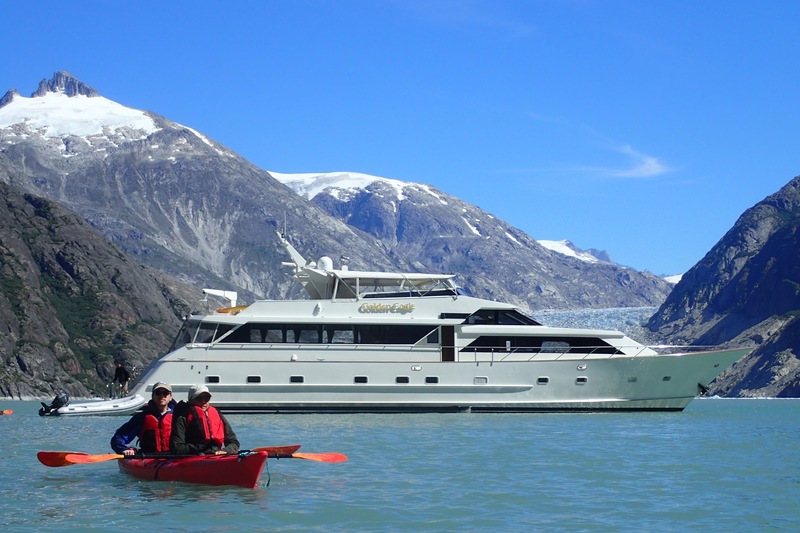 The M/V Sikumi has a small motorized inflatable excursion boat, also know as ‘The Skiff’, in which the Captain can take you wildlife viewing, glacier viewing or to the shore for hiking, beachcombing, campfires and a myriad of other shore activities that are available. We have 5 single and 2 double sea kayaks. Sea kayaks are wider, and therefore more stable, than a normal kayak. This makes them the perfect sturdy ocean going craft. We launch off a specialized aqua port and all kayaks have tight-fitting protective skirts, so there is very little chance of getting too wet. Glaciers and wildlife are experienced up close as you paddle through the clear, cool waters of Alaska’s Inside Passage. 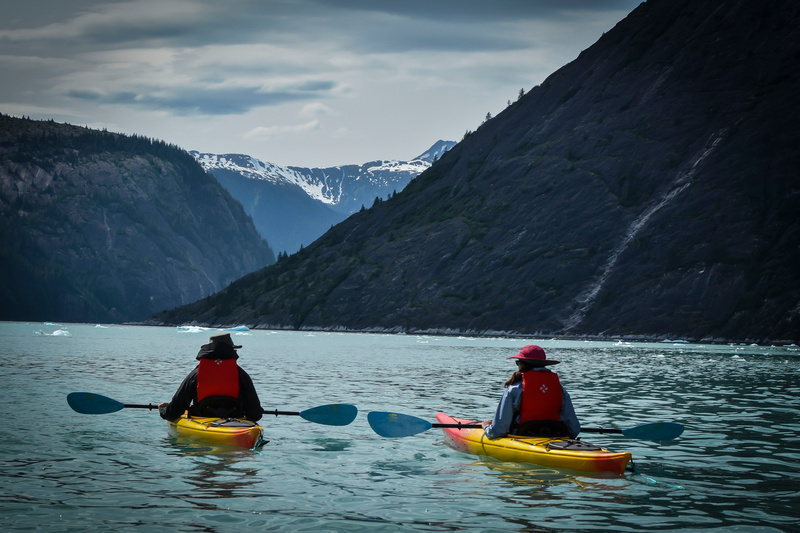 Navigate your Kayak through the icy waters or choose to paddle to shore for a land excursion to hike in the Tongass National Forest, visit Natural Hot Springs or simply to beachcomb and explore the tidal pools on shore. The Inside Passage near Juneau is world-renowned for its scenery, its wildlife, and its jaw-dropping ice walls. Glaciers and icebergs abound inside of the fjords and inlets, and experiencing them is altogether unforgettable. On our customizable Alaskan cruises, guests can watch coastal glaciers break apart and crash into the bay in a process known as calving. The sound is so loud that many mistake it for thunder or an explosion. You can also get up close and personal with the ice by getting out on the water and kayaking around the floes. We also love collecting glacier ice to put in your dinner drinks. If you have never kayaked before, there are some considerations. Kayaks are small, low to the water crafts that can be difficult to maneuver. A minimum level of fitness is required. If you are not able to kayak, we have a stable inflatable skiff boat that still lets you explore with the kayakers. A kayaking adventure can be enjoyed by all the family, young and old; and if there is anyone too young or not too confident, they can either go in a double kayak with someone more experienced or on the skiff, so nobody misses out on the fun. Even in a place like the Inside Passage where wildlife is common and curious, loud noises can still scare them off. 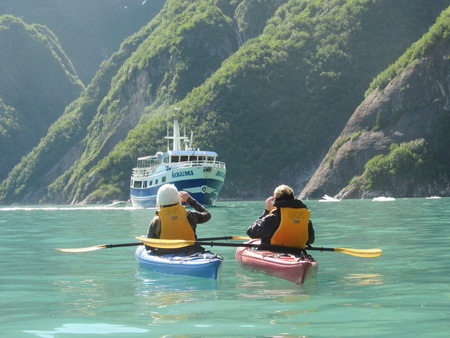 That is why we love to anchor the Sikumi and send our Alaskan Cruise guests out in one our kayaks. From here they get a once-in-a-lifetime experience amongst the wildlife and the exceptional beauty of this pristine environment. Kayaks provide a safe space to watch bears, many bird species, and even bald eagles. We also often see sea life such as otters, whales, dall porpoises, and many others. If you are uncomfortable in the Kayak, we also have a skiff boat that allows you to join the fun and experience the magic. Kayaking can be an adventure shared or just a good, plain, old fashioned romantic experience. You can either go side-by-side in single kayaks or you can paddle together in a double. You can get in close amongst the wildlife and glaciers, or take a picnic for two to the shore and find the perfect spot to enjoy it.